Vertigo is a false sensation of movement. It is a subtype of dizziness that becomes increasing common as a person ages. Often, the condition presents itself as the room seeming to spin around a person. Is there a connection between anxiety and vertigo? How can vertigo be helped naturally? Read on to learn more about ways to control vertigo. Anxiety attacks can lead to hyperventilation. This can easily cause a bout of vertigo. It can also result in dizziness, difficulty thinking, and weakness. Stress is also a factor in vertigo because stress can increase anxiety. According to one study, anxiety and panic disorders commonly appear side by side with vertigo or dizziness. While the exact cause is not understood, it makes sense to seek anxiety and stress relief methods to decrease the risks of vertigo. Meditate on positive things – Rather than just clearing one’s mind, use meditation to focus on positive and good things that you have in your life. If doing so for half an hour is difficult at first, start with sessions of just a few minutes and work your way up. Get some exercise – Exercise creates endorphins that make a person feel good. Plus, blood flow is increased in the body. Talk to a friend – Sometimes our stresses are just a matter of bottling everything up. Talking to a confidant or sometimes a health professional may help decrease anxiety levels. 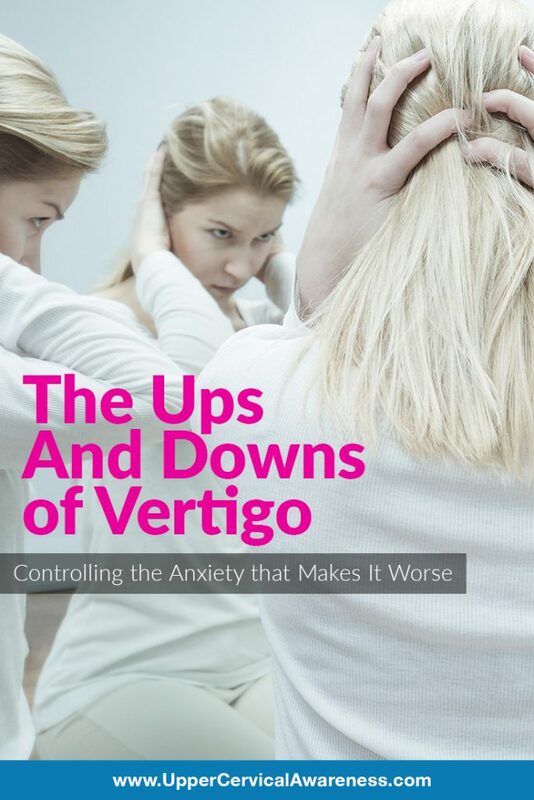 Of course, stress and anxiety are just triggers of vertigo and not the underlying issue. Is there anything that can be done to help vertigo at its source? Upper cervical chiropractic care has helped many vertigo sufferers to find long-term relief. This is because an upper cervical misalignment can result in reduced blood flow to the brain or even pressure on the brainstem. Correcting the misalignment has been very effective in case studies. To learn more, contact an upper cervical chiropractor near you. You may be a consultation away from getting on the road to being vertigo-free.